Sometime during December Nashbar and Performance run one of their rare 20% off coupon offers. I ussualy don't buy stuff unless I am in the market for something and it happened the week before I got the coupon news I had registered for the 2007 San Francisco Randonneurs Brevet series, the whole chabang, I still don't know how many events I will do but I have the best intentions :) My birthday falls in the middle of December so for this upcoming series I though I will give myself a b-day/x-mass present, the 3W Dinotte thing. I ordered on line a DiNotte 3W light and requested the "Price Match" Performance offers. When the package came on the mail they had not applied the price matching so a quick call was due to get things corrected. The customer service person informed me they would only do one of the two offers. I told her there was nothing on the website stating this and if they could not do both things I would return the order. After being on hold for a while she came back with the offer to give me a gift card for the difference which I accepted as I buy stuff from the San Francisco Performace Store every once in a while. At the end the new toy cost me less than $140. That is what I think this light should retail for. maybe in a year from now (Dec '07) that's what they will go for. Last year I used a 1 watt LED Pinceton EOS on the helmet and a 1 watt LED Planet Bike on the bicycle. They complement each other, the Princeton proyects a spot beam waaaaay ahead, the beam on the Planet Bike is wider. They are just adequate for my needs but the good thing is they are light and simple and they run for a while on a single set of batteries. Back to the DiNotte. This thing is just cute but under that pretty face is hidden a powerful light. I've been doing some of my weekday rides (~20miles) at night just for a change and to test the light and get used to riding at night again. I used the Princeton EOS on the helmet and the DiNotte 3W on the handlebar. The two are a good combination much better than my previous setup. When I turn on the DiNotte it starts in Low mode, this "low" mode is way brighter than two or three 1 watt LEDs and if left there I get 3h:20min. On high the DiNotte runs for 100 minutes. 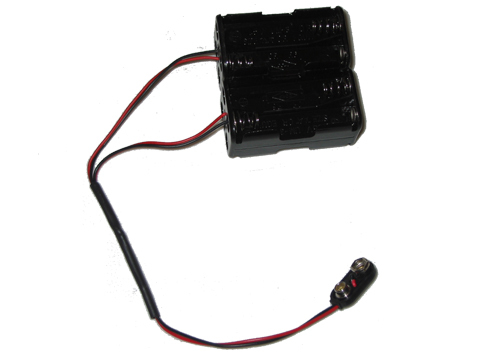 Both figures with the included four AA NiMH rechargable batteries (there is also a smart charger in the package.) The beam is always very even and I have not noticed a decrease in brighteness common to other lights when the batteries are low. When the batteries are low the beam flashes a couple of times very rapidly and the on/off switch turns from green to red. Supposedly the light does not turns off at all, all of the sudden, a great thing if you ask me. So back to the Brevet thing. I need a light that will run at least four hours on a single set of batteries, that way I can carry two sets for a night 's worth of riding, one installed and one in the backpack. According to the DiNotte's website if I use Lithium disposable batteries I should get a 30% longer running time, that is 130 minutes for four AAs. 8 AAs connected in parallel (positive to positive, negative to negative) will provide me with 260 minutes or a little over 4 h:20 minutes of high beam, that should do for my needs. I was going to buy some Lithium batteries so at the same time I ordered two of this battery holders from batteryspace.com (part #BE4AA, $0.95 each at time of this writing) it it nice as it has 6" leads (They are shorter here as I cut them during my "tests") I also bought a 9V snap connector at Radio Shack (Model 270-324, $1.95 for a package of 5) BTW: Radio Shack sells the exact same 4 AA battery holder the light came with in case you need an extra one, they are cheap ~$1.60 each. 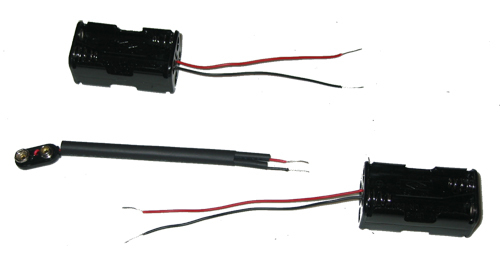 They also sell the battery holders with cable leads, I just bought mine from BatterySpace as they sell batteries, rechargable NiMHs and regular Lithiums, at very good prices. 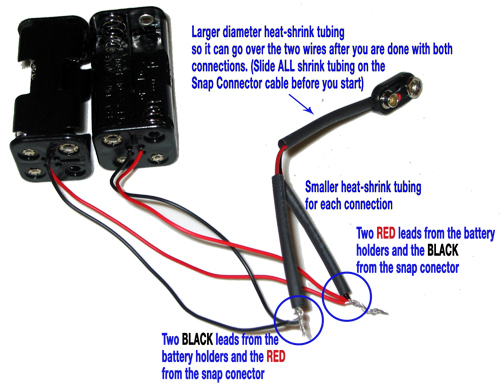 Connect RED to RED and BLACK to BLACK on the two battery holders and connect the BLACK cable of the 9V snap connector to the pair of RED cables and the RED cable of the 9V snap connector to the pair of BLACK cables of the 9V snap connector and , viola! A larger capacity battery pack. I could have used four C or even D batteries holders but since I don't use those large batteries for other things I could not justify them. I can however use AAs in many things so I will run Lithium disposables on the longer events and regular NiMHs on the 200k and 300k brevets. That should do it. Now to carry the new "larger battery pack" I'll just throw a little pouch together, I can attach it to the frame or place the new holder inside a small handlebar bar I use on brevets. That's it. a freaking spanking larger capacity pack on the cheap for the Dinotte light. Hi.. I'm the fellow that designed and shared version two. Just a follow up to the question posted. I have a cell phone holder that both battery packs fit into nicely. It attach it just under the head tube with Velcro. The cell phone pocket I use is one of those heavy duty types that you buy at Home Depot. I drilled the rivets out and removed the spring-steel clip. Sorry for taking so long to respond. I made a battery bag from a scrap piece of some vinyl fabric I had but about any material will do. Mine is just a very simple bag with a velcro closure and I use a longer velcro (bought a package of 3 strips at Ikea for about $3, if I remember correctly) to attache it under the stem. Simple and effective, It holds the batteries in place even when riding off-road. Hope that helps. Nice info... I tried the updated version and it works well. Great idea. I was wondering what kind of bag your using for the battery packs? I'd like something to go under the stem w/ the velcro straps. Maybe if I line them up I can use a flashlight holster? Thanks for help.